The Samsung Galaxy S4 GT I9505 is a stylish smartphone which runs on the Android operating system. It features a 1.9GHz Quad core processor that ensures optimum multitasking performances. With the 16GB internal storage space of the phone, users can store apps, videos, pictures, and more. It features a stunning 13MP camera that delivers amazing pictures and videos. The phone supports 4G LTE and features built in WiFi, which offers seamlessly internet connectivity on the move. This phone has a trendy design and is available in a Whitemist color. Life Compatriot The Samsung Galaxy S4 GT I9505 helps to make your life simple, rich, and easy. It helps you come closer and capture those lively moments effectively, enjoying every bit of the process. The features of this smartphone are designed such that they assist to simplify your daily lives. Moreover, the Galaxy S4 even puts your health on priority by monitoring it. 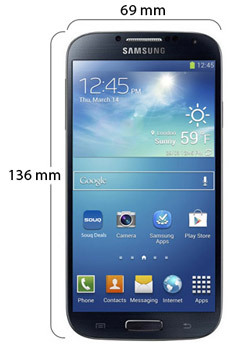 In simple terms, the Samsung Galaxy S4 GT I9505 is your perfect life companion. Capture incredible pictures with Dual Shot The Samsung Galaxy S4 GT I9505 is equipped with two cameras to let you capture extraordinary photos. The front and rear cameras of the phone help in simultaneous shooting so that you can capture the special moments of your life. It features a variety of styles to help you get that perfect shot. With Dual shot, you can share your daily experiences with friends and family, irrespective of where they may be. The Samsung Galaxy S4 GT I9505 lets you capture every picture with a soundtrack so that you not only remember what your favorite moment looked like but also what it sounded like. In simple terms, it lets you relive and share each and every captured moment more vividly. Capture everything in one photo The Samsung Galaxy S4 GT I9505 lets you see a sequence of photos in a single frame by creating a collage that tells the story better than a single photo. You can capture a series of pictures of any moving subject and put them together with the phone’s Drama Shot feature. This allows you to view the detailed action merged into a single lively photo. Share your joy with your friends Make your friends listen to your music simultaneously. The Samsung Galaxy S4 GT I9505 helps you to wirelessly connect to other Samsung Galaxy S4 phones to play games and share photos and documents. Create a powerful sound system by getting all Samsung Galaxy S4 phones together to improve the sound quality and keep the party going. The Samsung Galaxy S4 GT I9505 helps you to organize your photos and create albums based on specific events. You can even modify them according to your style and liking. It allows you to apply themes and choose layouts as well. You can print the captured pictures and cherish the memories. One integrated shop for all your favorite content The Samsung Galaxy S4 GT I9505 allows you to access and shop through any content available from every Samsung Hub in one place. You can access music, videos, games, and learning, all in one integrated store. The Samsung Galaxy S4 GT I9505 features all that you’re looking for in a beautiful and simple to use magazine layout. S translator makes communicating easier You can say or text what you need translated into your new Samsung Galaxy S4 GT I9505 , and it’ll read or text back the translation for you. It serves as a handy companion while traveling abroad allowing you to discover exotic foreign dishes, easily communicate with locals, and explore hidden places around the world. New ways to communicate The Samsung Galaxy S4 GT I9505 allows you to share your onscreen information with one of your friends, irrespective of how far you are from each other. It has enjoyable features like funny mask effects and background change to provide an enhanced chatting experiences. With the ChatOn feature, you can connect with family and friends on a more intimate level. With the Samsung Galaxy S4GT I9505, you can hear everything with an optimum balance and volume customized for you. Based on your preferences, sound source, and hearing, it dials music up and down and balances the audio. You can hence enjoy the best sound experience tailored for you.